I have huge news to share with you! The Council of Canadians is about to kick our 2015 election campaign into high gear with a real game-changer. As a valued supporter of this organization, I want you to be the first to know. In our election survey I asked you and 125,000 fellow supporters how you want the Council of Canadians to direct our focus, energy and resources. You told us a top priority must be to boost voter turnout from the community level up – especially amongst young voters. I couldn't agree more. So today I'm thrilled to share with you this blockbuster news: Brigette DePape has just committed to be our National Youth Vote Organizer! 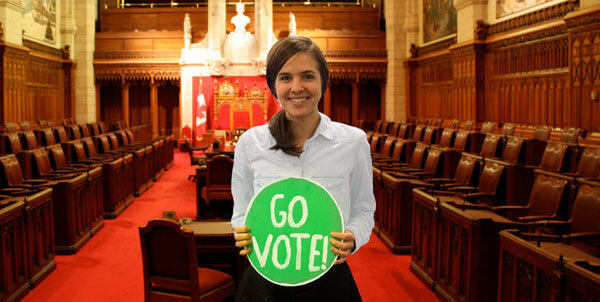 You know Brigette as the young parliamentary page who held up her iconic “Stop Harper!” sign in the Senate. But you may not know that since then she has emerged as a leading voice on the political landscape and a driving force within many youth movements – including with the Council of Canadians. Her courage and credibility has rightly earned her recognition as one of Canada's most influential Millennials. Now Brigette wants to inspire a movement of young and first-time voters to “Go Vote!” And I believe this could be a legitimate game-changer in the election. Connect with young voters: Studies reveal a strong correlation between personal contact and increased voter turnout. Brigette will work with student and community leaders to organize creative actions and canvassing in swing ridings to engage face-to-face with young voters. Equip them with knowledge: Based on feedback from Brigette's meetings, the Council of Canadians will develop free and accessible election resources specifically designed to encourage young people to vote, to help them make an informed choice, and to make it easy for their peers to join them. Galvanize the youth voter movement: Brigette will feature in our national ad strategy aimed to engage and inspire one million young voters, to help recruit volunteers in swing ridings, and to build critical momentum leading into election day. Sound like an election platform you can get behind? Your donation today will directly help to put this bold plan into action. My request is urgent. If Stephen Harper called the election today (and he could), the Conservatives are in position to remain in majority power for another four years. That's in part because less than 4 out of 10 young people would likely cast a ballot. And the Conservatives are quite happy to keep youth voter turnout low. Just look at the 2011 election results for the Ontario riding of Nipissing-Timiskaming. The Conservative candidate took it by only 36 votes. But there are 5,300 students on the campus of Nipissing University. In all the Harper Conservatives took a majority government by a combined total of only 6,201 votes across 308 ridings. Imagine if together we can engage even a fraction more students to vote this time! And that's why Brigette DePape is the game-changer. I can't think of anyone in the country better positioned to inspire a cross-Canada movement of young people to “Stop Harper!” than her. Please give what you can today – I promise you it will be the best election donation you make all year! Prefer to donate by PayPal? Can't donate now? Challenge friends and family to join you in taking the 2015 Voter Pledge!